'The satire in Khajoor Pe Atke is not savage enough,' feels Prasanna Zore. Had debutant director Harsh Chhaya gone the whole hog to expose the hypocritical, self-serving institution of relatives and relationships, Khajoor Pe Atke would have been a paisa vasool film. Not that Chhaya doesn't try, but the film lacks cutting edge satire, that X-factor. To twist Leo Tolstoy's 'all happy families are all alike', Khajoor Pe Atke is a film about the Sharma family that is not only happy like all families, but it is also hypocritical like families you must have come across. 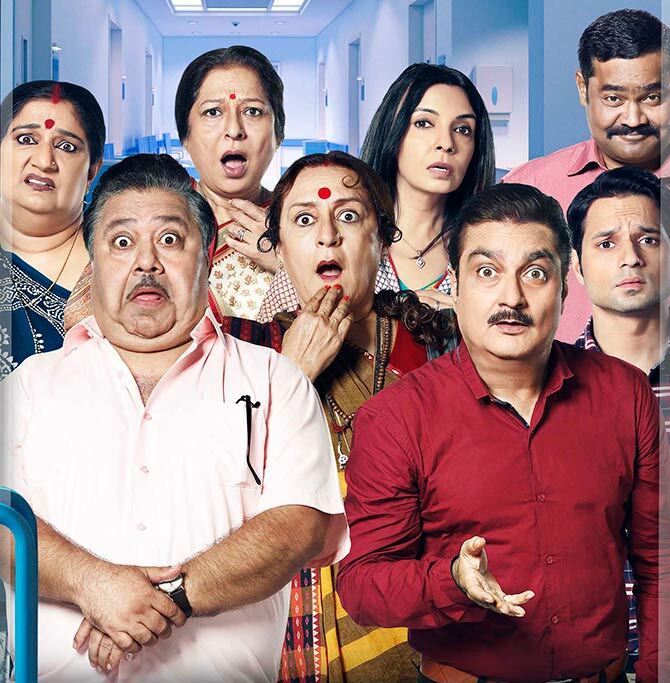 One of the brothers in the Sharma family is in a coma and his brothers Jeetendar (Manoj Pahwa) and Ravinder (Vinay Pathak) and eldest sister Lalli (Dolly Ahluwalia), ridden by their 'duniyawale kya kahenge?' and 'zindagi bhar sunate rahenge ki hum log dekhne nahi gaye' guilt come visiting their bed-ridden, coma-stricken, brother Deven (Birendar), his wife Kadambari (Alka Amin) and son Alok (Vicky Arora). Being the family that the Sharmas are, they bring their children and wives Sushila (Seema Pahwa) and Anuradha (Suneeta Sengupta) too. But it is not just guilt that brings the horde to the hospital. There is Deven's inheritance to be taken care of by the brothers and their wives. The sons in the family -- Amit, Aditya and Deepak (Nabeel Ahmad, Daljeet Singh Gujral and Basu Soni) -- are more interested in ogling at Mumbai girls, visiting dance bars etc. Jeetu's daughter Nayantara (Sanah Kapoor) is smitten by Bollywood's charm and glamour and has a Facebook friend Rocky Dilwala (Prathamesh Parab) who promises to give her a break in the movies. More than their love for the coma-stricken Deven or being with the near ones in times of distress, everybody in the Sharma family has self-serving purposes to come and see him. While Chhaya succeeds in creating the image of self-serving, hypocritical, relatives and the relationships they carve out for whatever it is worth, he fails to move the viewer into contemplating himself/herself in place of the two brothers, their wives or their children. Khajoor Pe Atke's satire fails when it comes to provoke viewers into believing that there is a little bit of Jeetendar, Ravinder, Lalita, Sushila, Anuradha in all of us. Chhaya fails to make the viewer stand in front of the mirror and see bits of these characters in their reflections. The satire is not savage enough: It only evokes laughter, but no self-reflection. While Chhaya paints most of his characters in shades of grey that are more tilted towards black, the balance in the film's colour palette tilts towards the white when it comes to the mother-father-son trio of Deven, Kadambari and Alok. Their altruism as the film climaxes only disorients viewers who have been administered the bitter potion of chicanery, distrust and selfishness through the film's two hours. Khajoor Pe Atke is a half baked satire on the selfish us that only partly exposes the darkness that lurks within every family.